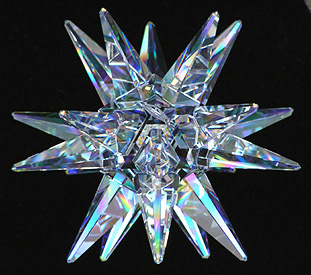 Gorgeous Huge Swarovski Crystal Creation • The Moravian Star 120mm AB. Click on the Photo for More Information! Welcome to Our Candle and Crystal Gift Shop! Welcome to our Crystal Shop and our World of Crystals! 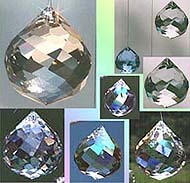 Sundrop Crystal has beautiful Swarovski crystal prisms and crystal gifts! Prisms in direct sunshine make gay colorful Rainbows that dance on the walls of your room! Once you've seen them, you'll wonder how you ever lived without them! Brilliant, deeply colored Rainbows, splashing on your Walls and Ceilings! Make a Sunny Day even better - Just Add Swarovski Crystal and Beautiful Rainbows! 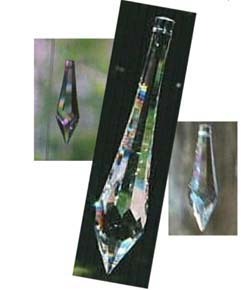 Crystal prisms are gorgeous! A finely crafted treat to decorate your windows. 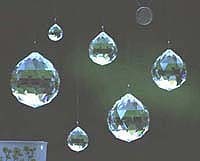 Window crystals sparkle and shimmer and add beauty to your home. 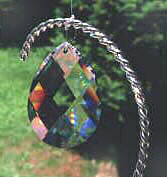 AND, if beauty and craftsmanship are not enough, crystal suncatchers make Rainbows, too! Browse our crystal shop and see what wonderful things we have for you! 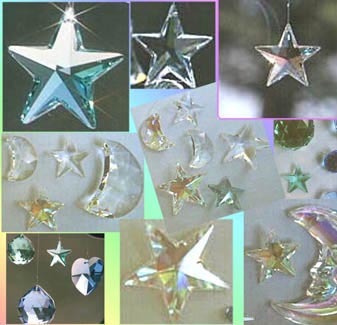 There are many crystal shapes like stars, moons, & hearts to suit your decorating tastes! Great crystal gifts! Prisms are ready to hang, & beautifully Gift packaged! Enjoy the amazing sparkly, shimmering beauty of Swarovski crystal, and the fun and bright colors of Rainbows! Crystal prisms are fabulous window decorations. Hang some in your windows, and get ready to love them for years to come! You might spend ten dollars on lunch today. Invest that instead in a crystal, and you'll have years of pleasure! Or make someone happy with a beautiful crystal gift! Long lasting crystal gifts are perfect for any occasion and are a great reminder of fond memories! Crystals give rainbows over and over! Pick a pretty crystal! 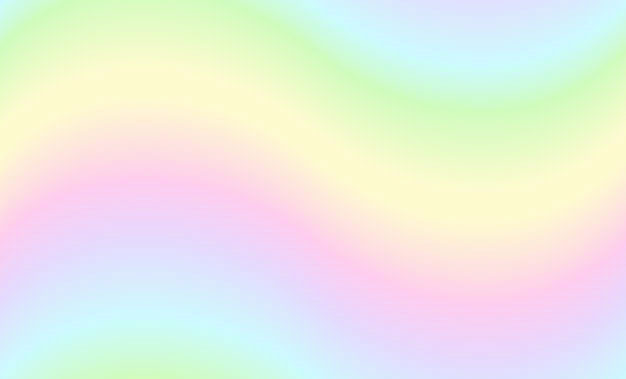 Experience the beloved magic effects of Rainbows dancing on your own walls! Crystals Plus Sunshine Equals Rainbows! Swarovski Crystals, Feng Shui, Tasteful Lasting Crystal Gifts, Divine Decorations, Rainbows, Sparkling Crystal, Gleaming Crystal Facets, Fun with the Sun, Splendid Shapes, Beautiful Prisms, Glorious Colors, Genuine Swarovski Strass Crystals! Enjoy all this! Our crystal shop is always open! Please visit often to see our new Crystal Treasures! THANK YOU for your interest in Swarovski Crystal! We hope you will love Crystal Prisms and Rainbows as much as we do! 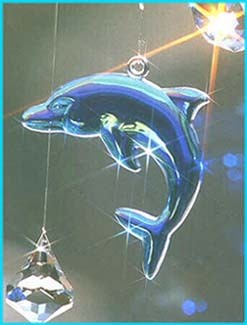 Crystal Suncatcher Blue Dolphin, shown in bright sun with Ball 30mm Blue at Top Right, and Bell 30mm at Bottom Left. Bell hanging close to the Dolphin keeps the dolphin from turning sideways. 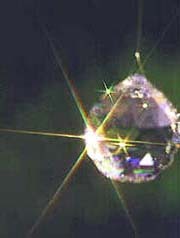 Photographed with a star filter in direct sunshine, to show the dramatic things window crystals can do. 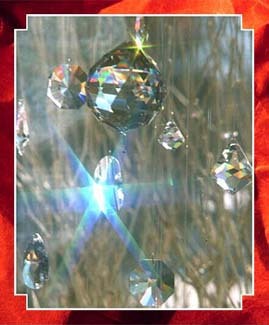 Enjoy beautiful crystal suncatchers, bright flashes of light, and rainbows! Your orders and information are Secure regardless of how you contact us. Customer information is not sold or given to anyone, for any reason. We will not email or call you except for personal correspondence or questions/information regarding your order. Beautiful Crystal Prisms to Make Rainbows!!! Crystal Suncatchers Do Amazing Things With Light! Crystals Fill your Life With Rainbows!!! 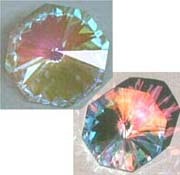 Visit www.sundropcrystals.com for rainbow crystals. 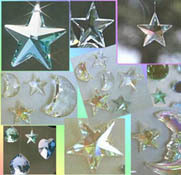 Find crystal suncatchers at sundropcrystals.com. 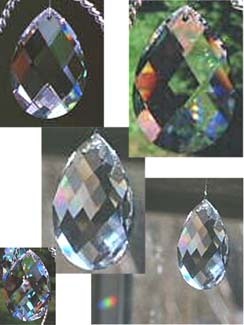 Get swarovski suncatchers at sundrop crystals. Gifts at www.sundropcrystals.com! Crystals Sparkling and Making Flashing Colors in a Window! Here is an actual Crystal Collection in a Window! Please enjoy a few of our crystal pictures! Thanks for stopping in to see our Photos! The dreary winter landscape outside this window is forgotten, brightened up by the flashing beauty of the crystals! Note the rainbow colors on the Crystal Ball (top center)! 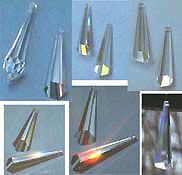 Visible From LEFT: An Icicle 40mm, Fancy Pear 50mm (bottom), Sunburst 40mm (top), Ball 70mm (big crystal at top center), Smooth Slice 50mm, Sundrop 60mm (bottom), Bell 30mm, and Bell 50mm. It is the little Smooth Slice 50mm making that huge Starburst! Not expensive, but it is an awesome little thing! Makes Great Rainbows! Fill your life with Rainbows!!! 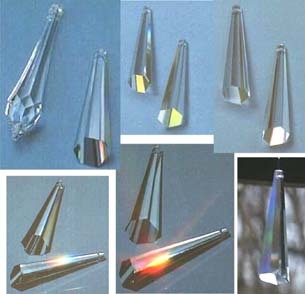 Beautiful Crystals that Make Rainbows!!! These Crystals are Excellent Rainbow Makers! A quilted look, or like a pineapple. 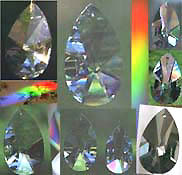 Flattened shape, oval with a point at top, like a tear drop, with BRILLIANT shining diamond shaped facets. The almond makes ABSOLUTELY STUNNING RAINBOWS, and is a gorgeous sparkler! This fine crystal is a MUST for your collection! Now in TWO sizes! 50mm and NEW 63mm! Long, straight, and exquisitely plain, but definitely not dull. Light shoots out of the bottom - Thus the name! Length is 76mm. A great shape and fabulous shine, even in the low light of a cloudy day. GREAT RAINBOWS! Rainbows from the Comet are especially wide and deeply colored. Mingle one with your hanging plants! Also shown in this photo (top left) is the lovely Icicle. Lots of facets, long, angular, and reminiscent of a crystal from a chandelier. The 100mm size as shown is especially beautiful. 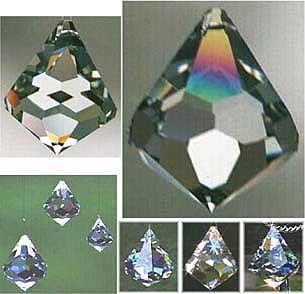 A very pretty crystal, lots of irregular facets and a tear-drop shape. Think of a beautiful pear-shaped diamond. One end oval, one end pointed, and just covered with facets! A lovely sparkler and a GREAT COLOR MAKER. Loads of Rainbows! Several sizes, including a very large, dramatic 76mm. Beautiful in either bright or dim light. MORE Beautiful Crystals that Make Rainbows!!! The Crystal Ball is the most popular of all Crystals, and with good reason! A single crystal ball can fill an Entire Room with RAINBOWS! 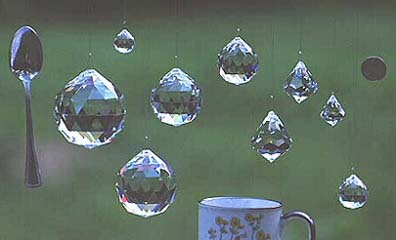 The Crystal Ball is Beautiful in All Sizes, and Makes Great Rainbows! Simply choose a Size, & Enjoy the sparkles & the Rainbows! Gorgeous in 100% pure through & through Clear Crystal. Most sizes are also available with 24K gold ‘ab’ aurora borealis coating. With Aurora Borealis Gold added, only a few facets are touched with the Golden iridescent color, to add a bit of extra sparkle and to make the crystal colorful when there is no sun shining. You can't go wrong with a Crystal Ball! 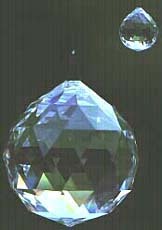 The Six Sizes of the Crystal Ball are shown here, along with the three sizes of Crystal Prism ‘Bell’. There is also a coffee mug, a spoon, and a US Quarter for size comparison! 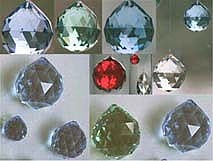 Pleasing round shape, dozens of sparkling facets. Available in SIX sizes ranging from 20mm, the size of a U.S. Nickel, to 70mm, about the size of an Orange. The 70mm Ball is at far left, with the coffee mug below it. The popular 40mm Ball is fourth from left, at top center. Pictured from Left to Right are: 70mm Ball, 20mm, 30mm, 40mm, 60mm, and 50mm. Note the U.S. Quarter at top right for size comparison. 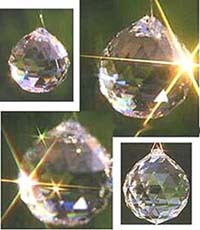 There is so much crystal packed into the Spherical shape of the Ball that the Rainbows are just Spectacular. Clear, or with a touch of Gold, or in a beautiful Color, each Crystal Ball will give you years of enjoyment. Pretty, shiny, and sparkly all the time. When the sun shines, the real fun begins~ Rainbows! Sizes range from 20mm (3/4 of an inch) to 70mm (almost three inches). All sizes are wonderful, but the LARGER the crystals are, the more impressive and dramatic both they AND the Rainbows are! They will last forever, so splurge and get a Nice BIG One! Breath-Taking Crystal ~ Fabulous Rainbows! Many Hours of Pleasure! The Rainbows will pick up your spirits every time! One of the few crystals that is truly round. Mixes nicely with other crystal shapes. Enhance Ch’i (vital energy) in Feng Shui decor with these beautiful Round Crystals. Simply choose a Size, and Enjoy the Sparkles and the Rainbows! Gorgeous in pure clear crystal. And, most sizes are also available with 24K gold “ab” aurora borealis coating. Beautiful ab gold is not applied to the entire ball, but just on a few selected facets. It adds sparkling iridescent color to the ball, especially in dim light, and still makes rainbows in the sun! Try one of each - See which you like best! They are very beautiful either way! Don't Miss the Ball in Gemstone Colors and the Swirl Ball! Spectacular Crystal Balls are available in your Favorite Colors! Beautiful Green, Sapphire Blue, Rose, and Red. They make gorgeous Rainbows just like the Clear Crystals! Here is a brilliant Ball 30mm Red hanging in a crystal display with a beautiful 76mm Fancy Pear crystal prism. They are very pretty together! 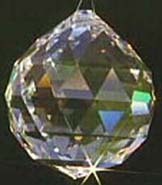 The Ball is Spherical in shape, with Triangular facets evenly placed all over its surface. These cut and polished facets give the Ball its beautiful sparkly appearance and also give it the ability to make Rainbows! The Swirl Ball is a Beautiful Crystal Ball with unevenly shaped facets in a swirled pattern. A truly lovely variation on the theme of the sphere. Ever so slightly teardrop shaped, and facets arranged in a wavy swirling pattern rather than by strict geometry. Gorgeous and VERY POPULAR! Great rainbows! Improve your Ch’i (vital energy). The Swirl Ball and the Ball are great for Feng Shui! 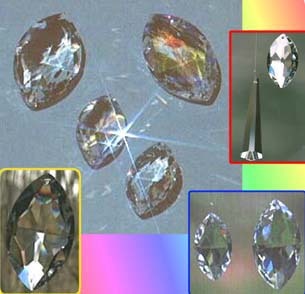 Buy an identical Pair of Crystals or Crystal Pendants. Give one to a Friend, and keep one for yourself. These will be a special reminder to you both of each other! perhaps when your Friend is thinking of you! 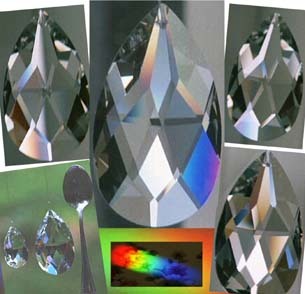 Incredible Rainbows from Crystal Prisms! 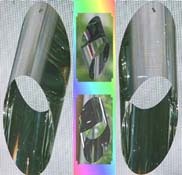 Crystals are beautiful, smooth, shiny, shimmery decorations for your windows. Did you know that they also make gorgeous brightly colored Rainbows? When the sun shines through the crystals, the colors of the Rainbow are splashed all over! More of the Very Best Rainbow Makers! Finely crafted Austrian crystal from Swarovski will provide years of delight. Crystal is a very highly refined optically pure form of glass. The crystals are cut and polished just like gemstones. 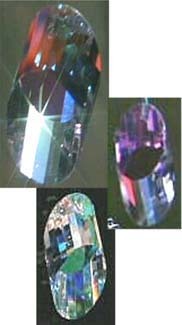 The facets cause the crystals to have a breath-taking brilliance. 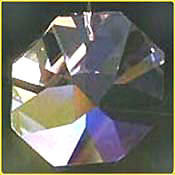 Our fine window prisms are made of the same crystal as the "Silver Crystal" figurines by Swarovski. Crystal LOVES to play with light! Beautiful Prism Shapes and Even More Great Rainbows! Crystals make wonderful Gifts! Small, inexpensive, yet long-lasting and lively. Someone you are fond of will enjoy your gift for many years, every time the sun shines! If you like suncatchers, you will adore these. They bring in the sun and also make gay colorful rainbows! As the sun moves, or the crystals move in a breeze, the rainbows move and dance! Pretty Crystal Shapes and Great Rainbows! Crystals can fit any home decorating scheme! Crystals are available in beautiful colors, and in your favorite shapes. Stars, moons, even dolphins can dance in your windows! Crystals are available purely clear, or with a light coating of 24K Gold called "ab" for "aurora borealis". 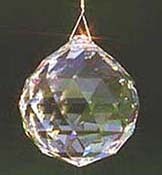 This gives the crystal a slight golden color and makes it colorful and iridescent in dim light. Try the delights of beautiful crystals today! You will wonder how you ever lived without them! 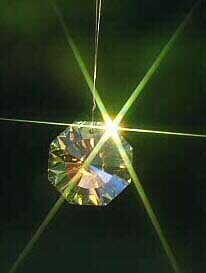 Crystal Prisms Do Amazing Things With Light! Just by being in the Sun! Crystals make gay colorful rainbows that flash all around them. 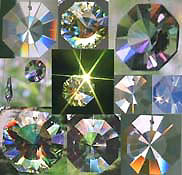 Crystals are shiny and shimmery and very beautiful. You must enjoy these crystals for yourself to understand the pleasure & entertainment they provide! Crystals can create high drama in sunlight! Sunlight is refracted, causing the bright colors of the rainbow to become visible! Brilliant flashes of light, as seen in this photo, and beautiful colored Rainbows, are produced by the crystals and light up your home and your life! Fill your life with Rainbows!! !